My name is Max Rudberg and I'm an interface designer from Stockholm, Sweden. I had a strong presence in the Mac OS X themes scene and made many popular themes during the early 2000s. I since went on to work for a design agency with focus on mobile phones. I’ve lived six months in Tokyo where we worked with Japanese operator KDDI. I’ve been back home since 2011 and dabbled in Stockholm’s startup scene and since went on to form my own company together with my wife; Filibaba. We make vegetarian cooking apps and do consultancy work. All kinds of projects at the moment. I'm focused on iOS and the Apple Watch and as a freelancer I'm helping companies in transportation, postal and banking here in Sweden. In Filibaba we're working on adding new content and possibly a utilitarian app tied to cooking. It's very gratifying being able to do everything in a product for a change. I work from home on a retina iMac. If I'm out at a client's office I have a MacBook Pro which I prop up with a The Roost stand. 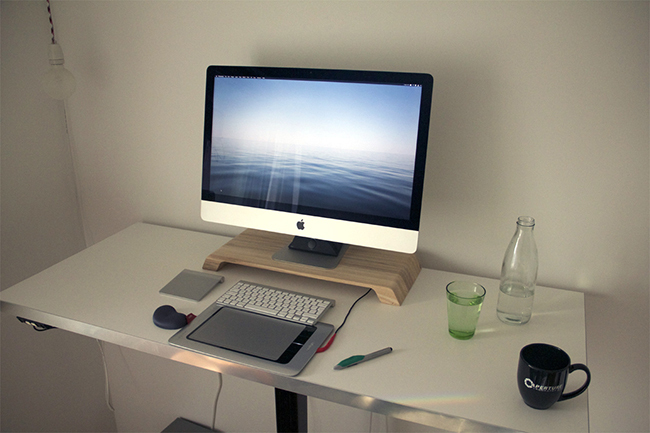 The iMac stands on a Lifta wooden stand. A mini amplifier sits on its foot, with speakers on the floor. Music is important. I try to stand in front of the computer, but it's really the mix of sitting for a while and standing for a while that works the best for me. I use a Wacom Bamboo tablet, modified with some Sugru clay to improve the grip of the pen. I use it mostly because if it's ergonomic advantages. Combined with the pref pane Smart Scroll, you can hold a modifier button and scrolling works just like tossing content on your iOS device. I keep the Magic Trackpad around for gestures. I spend most of my time in Photoshop, and I also use Cinema 4D and After Effects. I’m also quite fluent in Xcode, but mostly for managing assets and projects and tweaking existing code to adjust the design to my liking. It all depends on the project. I really like the setup in our home office, but it’s not always the most efficient way to work. You have to be disciplined not to get caught up spending time on the wrong things. Therefore the ideal work environment can sometimes be at the client’s office. I enjoy museums. There are several good ones here in Stockholm, Sweden. Fotografiska and Moderna Museet comes to mind. Watching anything by Studio Ghibli or Pixar is a good way to kick back and I recently got a Wii U to dive into the playful Nintendo-universe. And Monument Valley was incredible – we have a poster framed in our son’s room. Jonathan Ive definitely. I also enjoy the work of Mike Matas, Matias Duarte, David Lanham and Allison House.